How does the hang angle affect my hammock? I often field questions about the Hammock Hang Calculator about the hang angle. I made this quick illustration to show how the hang angle changes the shape of the hammock and thus affects the hang point and lay. However, Derek had to hold all the other variables static in order to make his point. after a night in the hammock my knees do hurt. Is that a problem with the angle? 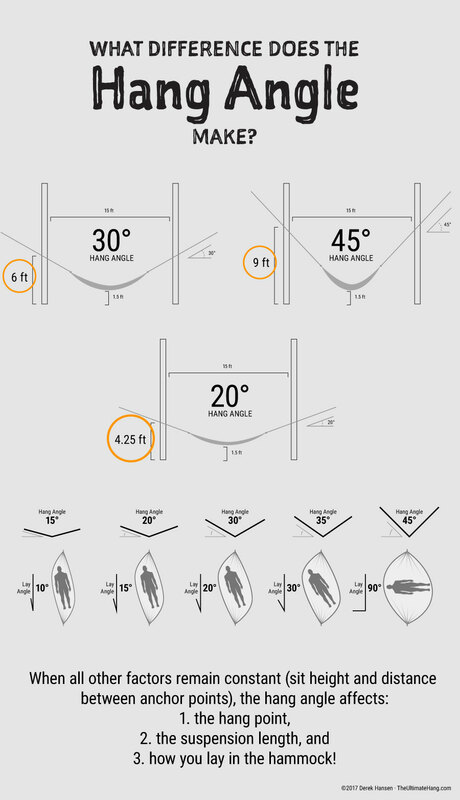 What hammock are you using, what size is it and how tall are you? What Hang angle do you use? I use the amazonas moskito traveller thermo. Metric ist is 275 x 140 cm long. I sleep diagonal and the hammock angle is (as good i could measure) at 30. I read in the hammock forum, that the knees are too much bend in the hammock. I dont like to sleep with the legs like a frog. Is there an other solution? The Moskito hammock is short. It’s harder to get rid of that calf ridge, but we can try! One way you can eliminate that ridge under your legs is to pitch the hammock off center. Put your foot side closer to the tree than the head end and then put the leg end a few centimeters higher than the head end. This will force your torso to move back to one end of the hammock and it should eliminate the calf ridge. Now, this technique works better with a longer hammock, but it may work with this one. Another technique you can try is to hang the hammock at a shallower hang angle, like 15 or 20 degrees. It will lay flatter and can also reduce the calf ridge on smaller hammocks. Let me know if either work for you. Sorry i forgot, i am 1,8 m tall.